Sea turtles are certainly on many minds these days. In addition to the rescue team and volunteers working long hours caring for these endangered rescuees, media has also been interested in their well-being. 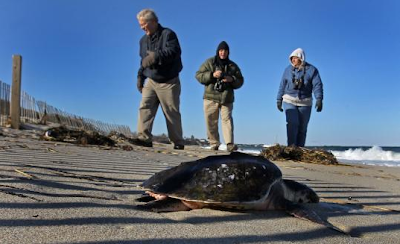 Today, The Boston Globe took readers to the chilly beaches of Cape Cod where the helpless and hypothermic sea turtles are washing ashore. Read more about rescue efforts, on the Cape and in Quincy where Aquarium rescuers are treating the new arrivals, in this Globe article. Turtle fans might also be interested in a Cape Cod Times article about the new facility in Quincy. 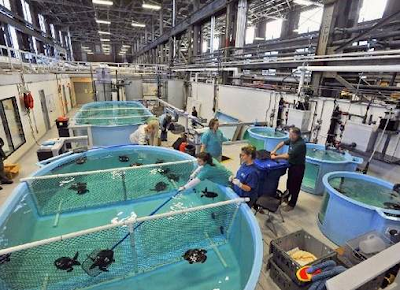 Where workers once manufactured piping for huge seafaring ships, now Aquarium teams are caring for those sea turtles rescued from the chilly seas, as well as cownose rays and bonnethead sharks. You'll read how the facility came on line just in the nick of time! Be sure to keep up with the Rescue Blog for the latest news and numbers from Quincy. So far more than 115 have been treated by Aquarium rescuers! The men and women caring for these vulnerable animals are an inspirational bunch. Wanna help? Learn how you and your cell phone can support the Aquarium as rescuers care for endangered species.